From Minimalist to Maximalist: The Changing Trends in Running Shoes - Healing Feet - NYC Podiatrist & Foot Doctor. Not long ago, Minimalist shoes were all the rage. Vibram Five Finger Shoes were the hottest product on the market, but Nike, Merrell, and New Balance all had minimalist models out as well. The idea was that barefoot running was more natural for the foot and racers could shave time without all that bulky shoe padding. Advocates claimed one could strengthen the feet and prevent common running injuries by wearing these racing flats. Some researchers charged that patients in minimalist shoes were suffering fallen arches, edema, plantar fasciitis, bone injuries, and soft tissue damage. However, some podiatrists defended the trend, stating that “overuse and osteoporosis” create stress fractures, and factors like “overuse and weak abductor hallucis, abductor digiti minimi and flexor hallucis brevis muscles” create plantar fasciitis conditions in patients. Here at The Center for Podiatric Care and Sports Medicine, we tend to agree with the later assessment. We give each of our runners a comprehensive exam. We send most of them through the gait analysis center to see exactly what biomechanical factors have led to the development of pain or injury. No matter the cause of injury, runners are always asking us what type of footwear is ideal. The recommendation of padding and structure has always been a mainstay of pediatric care. The Sacramento Bee recently reported on the trend toward thick padding for California International Marathon trainees. “The hot trend now is the opposite of minimalism–shoes pumped up with additional cushioning that is meant to provide stability and absorb shock,” says the Sacramento Bee. Industry watchdog SportsOneSource says the sale of minimalist shoes has decreased by 25 percent while sales of maximalist shoes have increased 19 percent in 2014. Sales of maximalist shoes like the Hoka One One have doubled in the last two years–largely because people like the feeling of cushioning as they run. There are other reasons, too. Runners like the idea of experiencing the “latest and greatest” in running technology. All the big players have developed their own versions of super-souped-up running shoes–the New Balance Fresh Foam, the Brooks Transcend, and the Altra Olympus, to name a few. It’s a larger and possibly confusing spectrum. On one side of the spectrum, you’ve got Vibram Five Fingers. 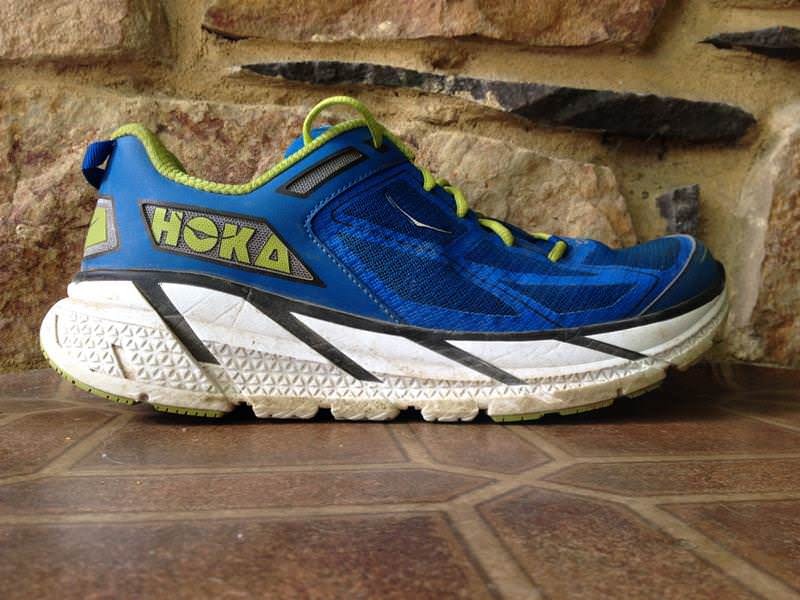 On the other side, you have the crown jewel “maximalist” shoe–the Hoka One One. The name–pronounced “HO-ka OH-nay OH-nay”–means “time to fly” in Maori. The road and trail shoe has twice the midsole padding of a standard shoe. The padding is comprised of ethylene-vinyl acetate, a polymer known for its impact-resistant quality. The shoes are stable and responsive, using rocker technology that keeps the foot in place with each foot strike. The midsole itself is made of RMAT rubber and synthetic rubber, which is so lightweight that, despite the extra padding, the shoes only weighing six to twelve ounces. Who Should Wear Maximalist Shoes? What started with trailblazers who needed a sturdier shoe to navigate tough terrain has now made it to street runners too, especially in older runners whose knees may not be as strong as they used to be. Podiatrists recommend that runners who exceed 160 pounds wear more padded shoes to prevent metatarsal stress fractures, knee injuries, ankle injuries, and tendinitis. However, it’s important to understand how your own unique biomechanics affect your gait, wear patterns, and shoe needs. Shoe manufacturers like ASICS have taken this into consideration and market different models for different types of pronation or supination. Marathon runners should keep in mind that no matter which type of shoe you wear, after 160 to 180 steps per minute for two to six hours, every foot will start to ache, regardless of the padding. The Center for Podiatric Care and Sports Medicine in NYC helps runners determine their running style and shoe needs. If you live in the area, book an appointment with one of our foot specialists here.